Ok, so Christmas is still a while off. So, even, is Christmas in July, but you can't run a Kickstarter in early December and hope to get your product to people in time for Christmas, can you? Nope. 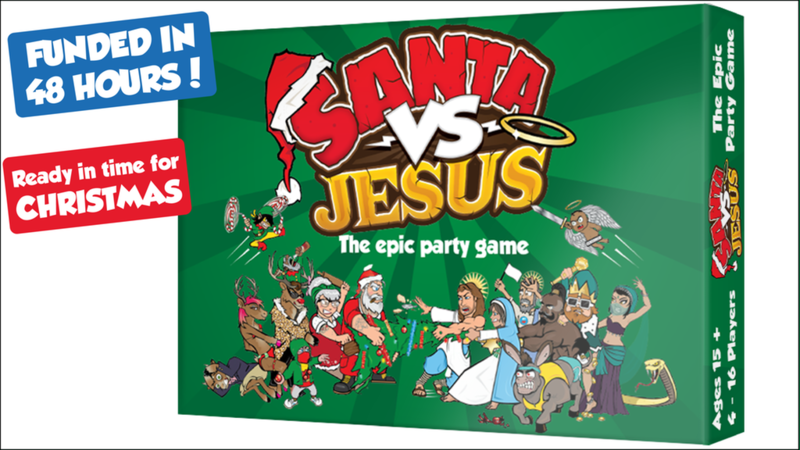 Producing a game takes time, and that's why Santa vs. Jesus is up on Kickstarter now. The game pits players against one-another to try and gain followers. One player (or more likely, team) represents Santa while the other represents Jesus. Both want to be the one who is the focus at Christmas. Players will engage in various games of skill in order to get people to their side. The one with more followers at the end will rules all of Christmas forever. The campaign's already over their funding goal. So it's on to breaking through stretch goals for the next 20 days.